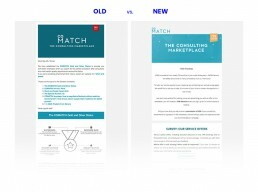 The team of COMATCH – the consultant marketplace, was using non-responsive newsletter templates that evolved over time without a designer guiding them. They were somehow working but also didn’t resonate with our user base as much as we wanted. So when I joined the company and was asked to redo the templates without losing the overall content structure, it was a delightful task to do. I checked all the analytics data to see, if the users are enaging with the newsletters, what interests them, what seems to be problematic. 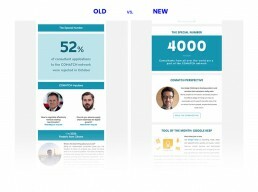 I noticed that a lot of users, mainly the ones receiving the newsletter dedicated to consultants, opened it on their mobile phone, where a non-responsive newsletter didn’t work well. For updating the templates and structure around the newsletters I teamed up with Inga, the colleague in charge of their content, and went through all the elements to see what we can improve. While working on the task I also enabled her to work independently with modern and easy to use templates that go with the WCAG guidelines and support most devices. I’m happy with the outcome and can proudly say that since we changed the newsletter templates we loose less users and receive very positive feedback.